You want to learn to work from home. And for good reason. The second you stop the daily commute, you save a ton of money, time, and gain that oh-so important happiness factor that comes with remote work. But, how do you go from wanting to work from home to actually working remotely? The good news is, remote work is on the rise — and shows no signs of slowing. This means there will always be new opportunities to kick your cubicle to the curb. It all boils down to having the rights skills to get you from commuter to telecommuter. Fortunately, if you’re feeling a little rusty in the marketable skills department, there are plenty of affordable online courses you can take to quickly and easily boost your know-how enough to get you remote working ASAP. When you take a step back and think about it, there’s a lot of content out there. Let’s look at the Internet. To date, there are more than 1 billion — yes, 1 billion websites in existence. And that amounts to a staggering number of articles, posts, and pages living online. Granted, not all things online are proofread. I’m sure as you read various blogs and sites you find tons of mistakes. I know I’m guilty of them here on Work From Home Happiness! But, that’s what makes proofreading so important and such a marketable skill for aspiring remote workers. You can offer your eagle eyes to those sites that so desperately need a proofreader as well as those that already recognize the value of employing a proofreader to ensure their content is published error free to the masses. Believe me, it works. Just ask Caitlin Pyle. She created Proofread Anywhere and her General Proofreading: Theory & Practice course in response to the high demand for skilled proofreaders. In a short time, you too can go from untrained, error-spotting samurai to highly-skilled and in-demand proofreading pro. But, before you dive right in, be sure to take the free webinar. You’ll learn what it really takes to develop this remote-friendly skill and how to actually put it to work in the real (or virtual) world. We’re all busy. It’s almost like a badge of honor these days to have an overbooked calendar and a to-do list for miles. But just because people are overextended, doesn’t mean they’re actually productive. I know I’m guilty. As a full-time blogger and one-woman show, I often find myself stretched pretty thin. My inbox is overflowing. Deadlines are constantly looming overhead. There are more pieces of content needing to be attended to than I care to remember. Plus, did I mention I have a life outside of online and a family who occasionally likes to see me in the real world? I do. It’s true. That’s why, I often admit defeat and hire an extra set of hands or two to help me stay on top of things when I just can’t do it by myself. And I’m not alone. Today, many bloggers, busy professionals, and brands call in virtual assistants to lend a helping (virtual) hand. A professional virtual assistant, or VA for short, is a magical wizard of productivity and time management. A VA can step in and help answer emails, coordinate a calendar, assist with project management, and generally help things keep moving forward. As an aspiring VA, there are no shortages of skills and services you can market to the perpetually overwhelmed, like me. To give yourself a head start in developing this highly sought after skill, visit Horkey Handbook created by the one and only Gina Horkey. A former VA herself, she shows you what skills you can market as a VA and helps you put them to work from anywhere! Fact: Entrepreneur named bookkeeping as the most profitable small business you can start. This is due to the fact that bookkeeping has little overhead and few startup costs. And, you don’t need a fancy (expensive) degree to become a bookkeeper. Instead, you just need to develop bookkeeping as a skill and market them to small businesses. Sounds easy, right? It is! And over at Become a Bookkeeper you can learn the insider secret’s to turning your love of math into a profitable skill you can use to work from home. There’s even a free video training series you can sign up for first to figure out what it truly means to work as a bookkeeper, and whether it truly is something for you. In a recent CNBC report, it was found there are more medical billing and coding jobs than there are trained professionals to fill them. To say this is an in-demand work-from-home skill would be an understatement. The healthcare industry is growing by leaps and bounds. And, medical billing and coding is an important part of the industry that plays a role in keeping patients’ records organized for payment purposes. You can learn a little more about what a medical billing and coding pro does by reading my in-depth article here. If you’ve always wanted a remote-friendly career in healthcare, this very well may be it. But, developing this skill takes time and training. You will need to attend school and likely obtain certification before you can land a high-paying job as a medical billing pro. The good news is, CareerStep has a fully online program that will teach you the skills needed to be successful and pass certification upon graduation. And, that means, you can quickly and easily develop this skill and become a work-from-home medical billing & coding pro in no time. I always thought of transcription as a pretty basic skill — if you could type, you could transcribe. Turns out, I was wrong. Transcription is a much more specialized skill than that. After all, you have to simultaneously listen to audio and transcribe what’s being said without making mistakes. And, when multiple people are talking, it’s up to you to differentiate between voices. It can all be very tricky. That’s why trained transcriptionists are in high demand in the world of work from home. There are even areas you can specialize in, like general transcription or legal transcription. Honestly, you can’t go wrong with either! Trust me, I know. My very first work from home job was as a legal typist. I transcribed insurance companies interviews, often about car accidents or other insurance claims that were being investigated. It was insanely interesting, highly flexible, and paid well too. To lay the groundwork to develop your typing skills into a full-on transcription career, head on over to TranscribeAnywhere. There you can sign up for a free general transcription course or free legal transcription course to find out if you’ve got the chops (fingers?) to become a paid typist. You either love writing or you don’t — there doesn’t seem to be any in between. Me? I love writing. That’s why I quit the corporate world to pursue freelance writing, even though I had zero professional writing experience. That eventually lead me to start a blog so I can focus on delivering the content I wanted 24/7/365 while helping others. If this sounds like a dream to you, you’ll be happy to learn that writing is a super in demand work from home skill that can be easily learned. As a bonus? You can take your writing as far as you want to. Become a freelance writing phenom? Sure. Self publish the next best seller? Absolutely. But, first things first, you’ve got to hone those writing skills in a way you can market them as a work-from-home skill. The best way to get started is by seeking advice from someone whose been in your shoes. And, I highly recommend Elna Cain as that someone. She launched a freelance writing career while raising twin toddlers, (crazy, I know). And now she shows you how you too can take your love of writing from daydream job to real life dream job. Her course, Write Your Way To Your First 1K, gives you the extra push to put your writing to work, so you too can make your first cool grand — and beyond. After you see a doctor or medical professional, they sit down and dictate notes about your visit. These notes are then transcribed by a medical transcription pro and become part of your permanent medical records. Thanks to advances in technology, doctors can also you special software to automatically turn their words to a transcript. However, software isn’t perfect and needs to be professionally edited before becoming medical record. That’s where the medical transcription and editing skill comes in handy. CareerStep has a Medical Transcription and Editing course that, you guessed it, teaches you both in-demand skills. In less than a year, you can learn everything you need to both transcribe dictation and edit software generated transcripts. There you have it — 7 in-demand skills you can easily learn to help you work from home. When you use an online course, like the ones listed here, you get step-by-step instruction that allows you to more quickly reach your work-from-home goals. Before you know it, you’ll trade in your daily drive for a short walk to your home office. You’ve got this! What do you think? Which of these work from home skills would you like to develop? Let me know in the comments below. P.S. This post contains affiliate links. Learn more about my use of them in my disclosure statement. 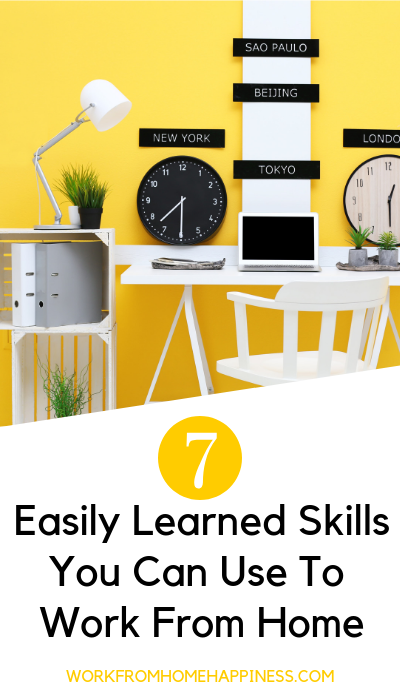 The post 7 Easily Learned Skills You Can Use To Work From Home appeared first on Work From Home Happiness.